I’ve become a bit of a recluse recently. Book number 2 is taking up all my attention at the moment with a final push before my deadline and I’m digging deep to keep the motivation going. I only really realised how little time I have spent in the garden over the last few weeks after a whole day of gardening on Saturday. The garden had started to look a little rough around the edges but it was the stiffness which followed the gardening that took me by surprise. I felt like I normally do at the start of spring, at this time of year I would expect to be ‘garden fit’. I sat down on Saturday night for an hour or so and then got up to get a cup of tea and Wellyman had to give me a helping push to get me upright. Too much time sat in front of my computer, I think. And, you know you need to get out more when you get a tad too excited about a punnet of greengages at the supermarket. The greengage is a fruit I’ve heard about but until relatively recently had never actually come across. It had almost started to take on mythical properties – a fruit that had once, many moons ago, filled late summer and early autumn kitchens where cooks wearing mop caps and proper aprons, surrounded by copper pans, would turn them into jams and compotes. Of course, I couldn’t turn down the chance to taste them, so a punnet was purchased. On the way home I wondered why they were such a rarity – they are deemed as a ‘speciality’ fruit by the supermarket. This thought only grew stronger once I had tried them, they were delicious. Greengages are cultivars of the plum family. If you think greengages are a fruit of the past it turns out there are also yellowgages, such as the amber-coloured ‘Coe’s Golden Drop’, and the strangely titled ‘transparent gages’ like ‘Early Transparent Gage’, not much time was lost on thinking up that name! 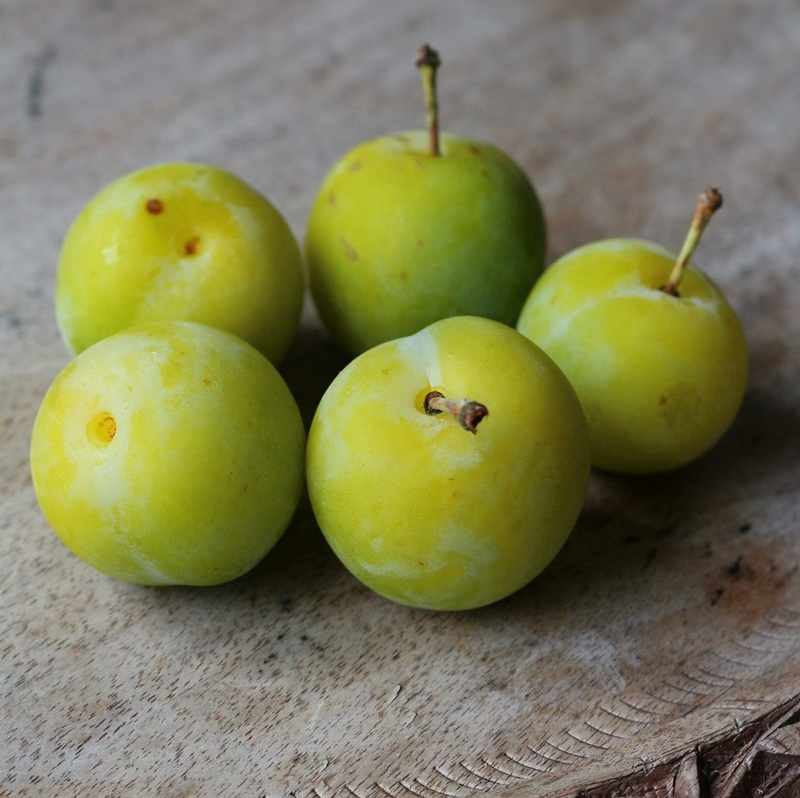 Greengages tend to be slightly smaller and a bit more round than a normal plum but the most obvious visual difference is the green-coloured fruit. There is something a little odd about biting into a green fruit. Your brain is saying ‘don’t do it, it’ll not be ripe and it’ll taste bitter’ but in the case of greengages your brain couldn’t be more wrong. That first bite is very much of a delightful honeyed sweetness and it is this that distinguishes gages, in all their various hues, from a typical plum. I love plums with their slight tartness but greengages are something else, so why are the shelves of supermarkets groaning under plums, and greengages are sidelined to the ‘unusual fruits’ section? Greengages have been cultivated from a wild green plum and are popular in Europe, particularly France, Germany and into Eastern Europe. It’s believed that they came to Britain from France in the 18th century, but the story is a little confused. Accounts vary as to whether they were imported by Sir William Gage to plant in his garden at Hengrave Hall in Suffolk or whether it was another branch of the family and Sir Thomas Gage (1781-1820) of Firle Place in Sussex which introduced the greengage. Whichever Gage, the story is that the labels were lost in transit and that when the plums turned out to be green they became known as green Gage’s plums. An avenue of greengages form the structure to the current kitchen garden at Firle. In France greengages are known as ‘Reine Claudes’ after a 16th century queen. Perhaps she gorged herself on them, which would be perfectly understandable, or maybe the royal gardener discovered these honey-flavoured fruits and named them after her. ‘Cambridge Favourite’, an old heritage variety is the greengage I bought but as it turns out there are quite a few to choose from if you’re thinking of growing your own. Some are more suitable to growing in the UK than others. And this is where we get to the crux of the matter – why they aren’t more widely available as a cultivated fruit? Well it seems like they might be a bit difficult to grow in a typical British climate. Gages need a lot of moisture which isn’t normally a problem for most British growers but they also dislike sitting in waterlogged soil. They also flower early in spring and, whilst the plants are hardy, the blossom is prone to being damaged by early frosts. Siting gages in a sheltered spot with plenty of sunshine to help that sweet, honey flavour to develop is essential. 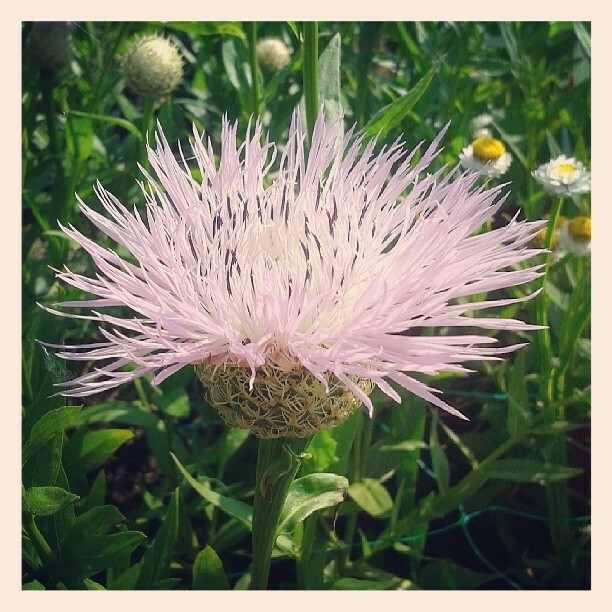 If you live in a frost-prone area there are varieties which flower later such as ‘Late Transparent’ – wow fruit- naming people you really pushed the boat out with those transparent gages. Some gages are self-fertile, others will require another fruit in order to produce a crop. For this reason it’s worth consulting a specialist fruit nursery if you fancy trying to grow your own. As for how to eat them. 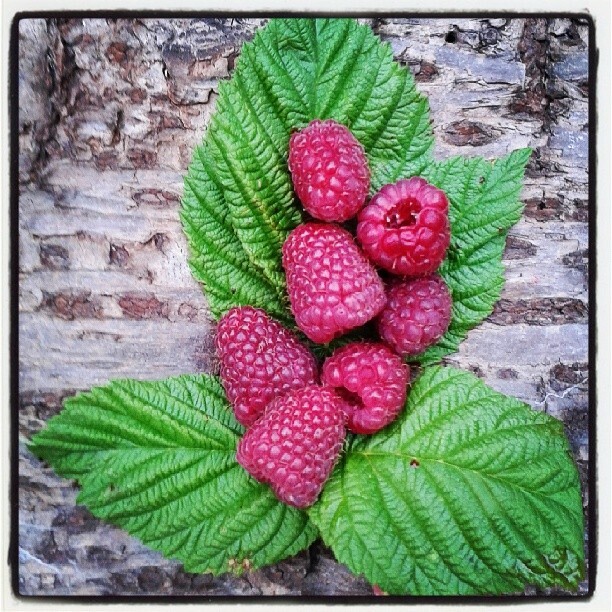 Well their natural sweetness makes them perfect for just as they are but they are an incredibly versatile fruit. 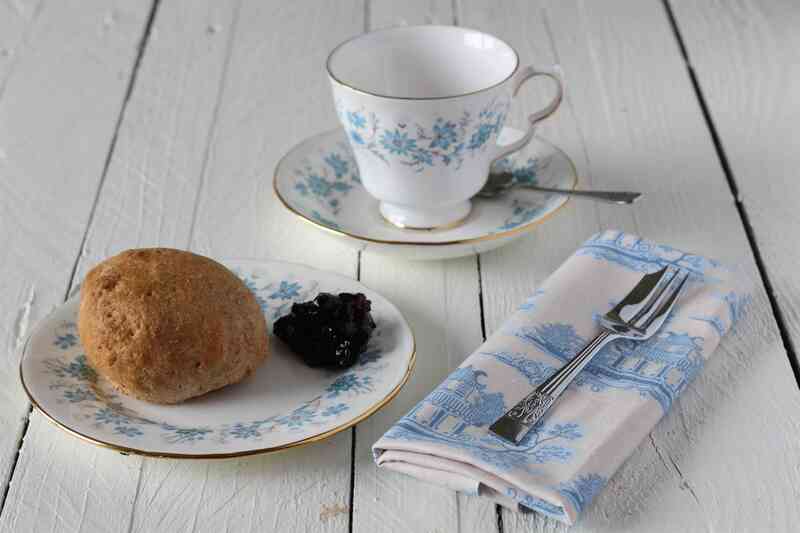 Try them in crumbles, pies, jams and chutneys. I often daydream about having my own orchard. The planting plans always included plums but never greengages. I’m not sure I’ll ever have the orchard but hopefully one day I’ll have the space to squeeze in a gage or two. My computer bit the dust the other day. It didn’t come as a great surprise, it hasn’t sounded healthy for a while now. The noise it was generating had become so loud I couldn’t concentrate, it was like I had an old diesel car under the desk. I had hoped it might limp on for a few more months and Wellyman had replaced a few parts. Then it took to shutting down without being asked to, but the final straw was the chequerboard screen of pinks and yellows which looked like a punk Harris Tweed – I knew then that the game was up. I’m not a complete technophobe but getting a new computer is such a faff, why you would do it voluntarily I don’t know. We’d had this one for ten years and it’s incredible how much stuff ended up on it. All I can say is that thanks to Wellyman I’m up and running again but if it had been left to me, well I wouldn’t have known where to start. I’m embarrassed and frustrated by this. I’m generally a practical, can-do type of woman but when it comes to IT I can get by but if anything out of the ordinary happens, well I’m stuck. It’s rather worrying that so much of life is becoming ever dependent on technology that requires the brain and dexterity of a teenager to get through all the setting up stages and glitches that inevitably appear. And don’t get me started on the thought process behind the creation of Windows 8.1. It took 20 minutes and a phone call to Wellyman to find out what they’d done with spell check. Still at least the new computer is quiet – I barely know it’s on as it purrs gently like the most contented of cats. The Welly household must be a bit of a technology black spot at the moment as my ‘not so smart’ smartphone keeps having a hissy fits too. This particular problem has left even Wellyman, who spends his working days fixing IT problems, perplexed. At times like this I crave a simpler life. The closest I’m going to get to getting away from it all, for the moment anyway, is escaping to the allotment. There can’t be many better antidotes to the frustrations of modern life than a few hours weeding, tying in sweet peas and picking flowers. 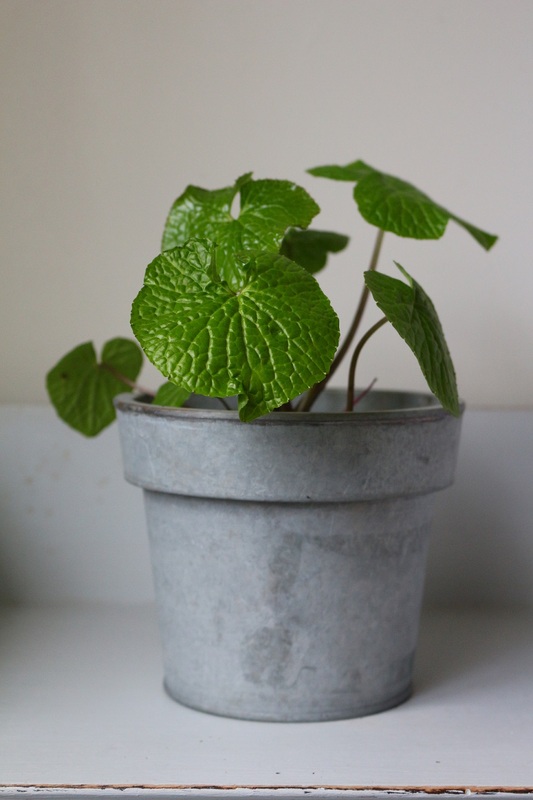 There’s a simplicity to growing which is good for the spirit which might explain why I have got a bit carried away this year with my growing. 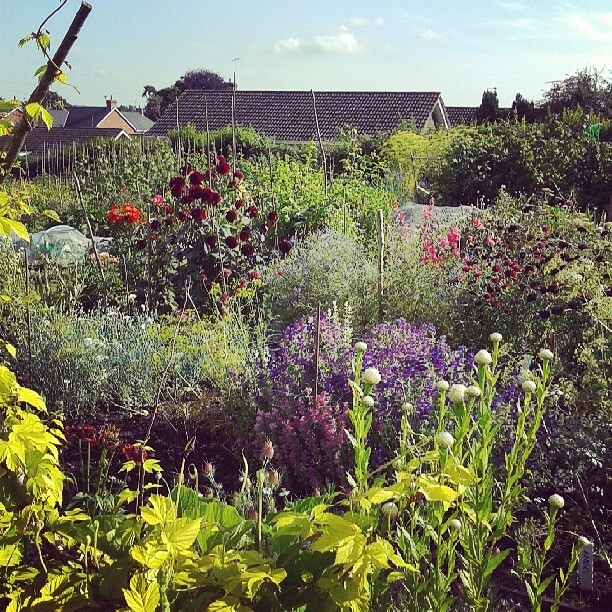 When I took on the allotment the plan was to keep all the veg growing there. It’s funny though how there is no longer enough space there for my ambitions and veg crops are now creeping into the garden again. Part of this is can be attributed to the idea that we may not have a plot or garden at all next year if we move so I’m going all out this year for a bountiful summer. 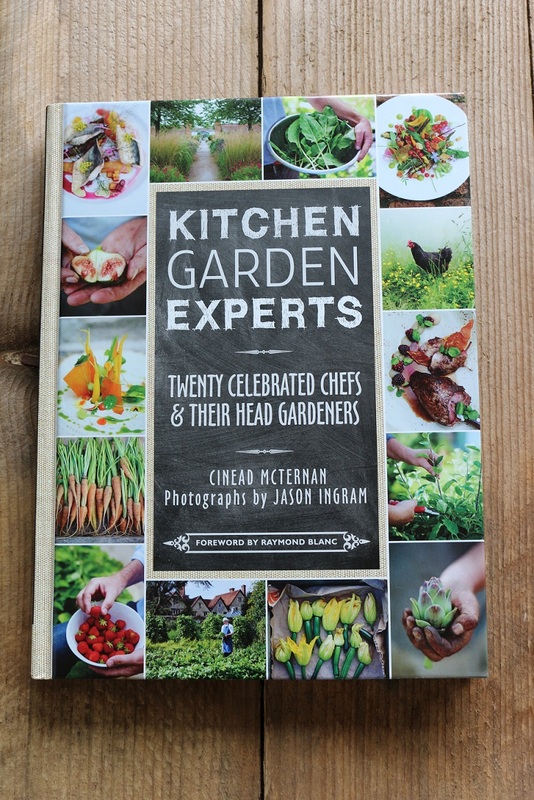 Inspiration has also come in the form of a book I bought a few weeks ago called Kitchen Garden Experts. It’s the creation of Jason Ingram, who took the photographs for my own book, and his wife, garden writer and editor, Cinead McTernan. They travelled the length and breadth of the country last year photographing the kitchen gardens of some of our top restaurants and picking the brains of the chefs and the gardeners who provide them with top-notch produce. I’ve found it a fabulous read. 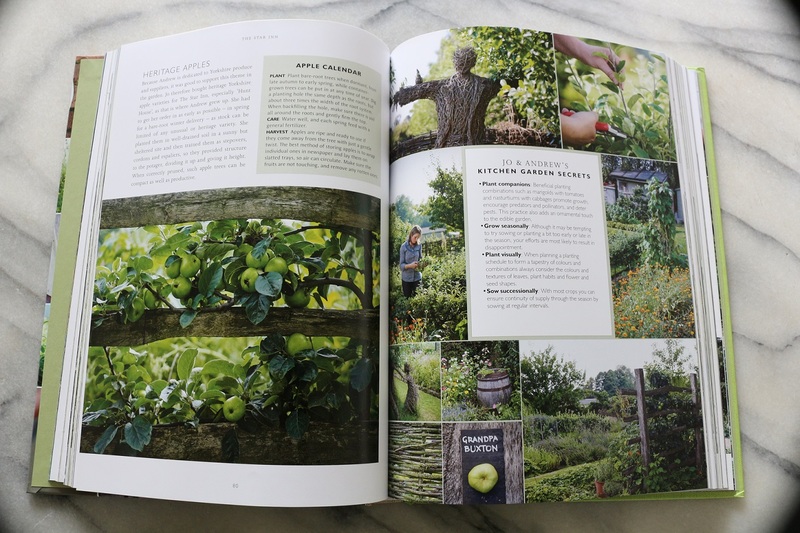 A few years ago I was lucky enough to meet one of the growers included in the book, Jo Campbell, who at the time was growing fruit and vegetables for Raymond Blanc at Le Manoir aux Quat’Saisons. Talking to her about how they work with the chefs to decide what to grow, how they can make the most of the produce when it’s brought to the kitchen and how they’re always looking for new crops, whether that’s seeking out inspiration from other countries or rediscovering forgotten native foodstuffs, was fascinating. 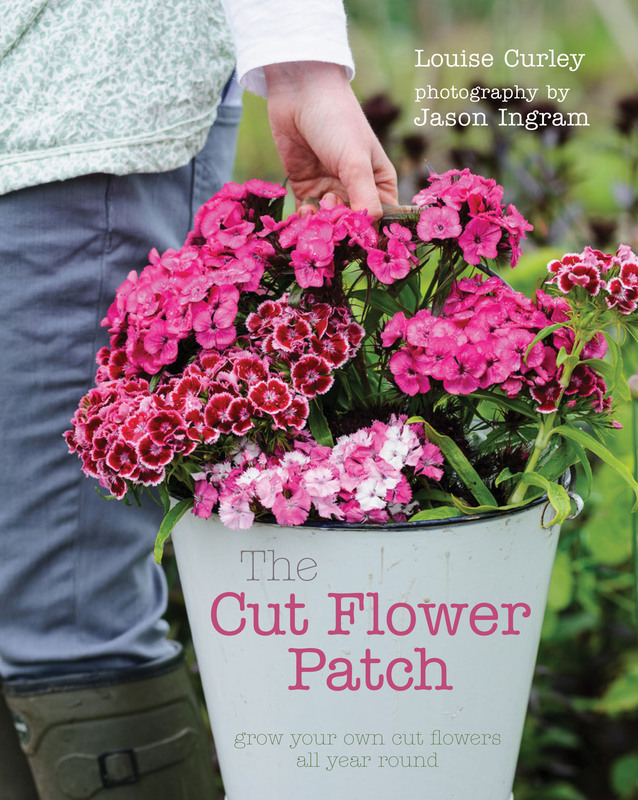 It’s this relationship between the chef and grower which is the basis for this book. 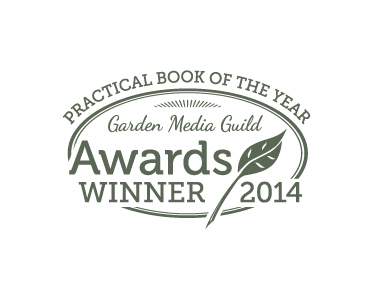 Kitchen Garden Experts cleverly combines two topics close to many of our hearts – food and growing. It’s a combination of restaurant guide and gardening and recipe book. You could easily use this book as the basis for a foodie pilgrimage to top eateries but it’s not short on horticultural information. 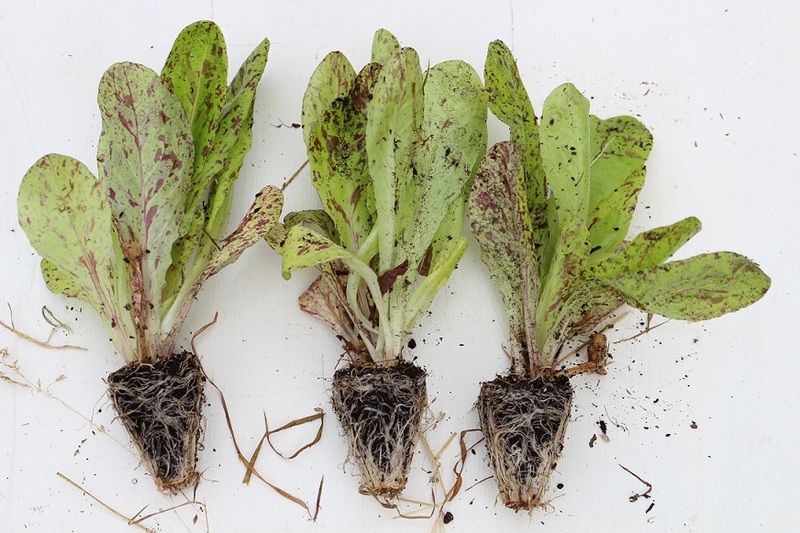 Cinead has packed it full of tips and techniques gleaned from experienced growers. I liked, grower for The River Cafe, Simon Hewitt’s policy of growing tomatoes originating from northern Italy as they are more adapted to our own cooler growing conditions. 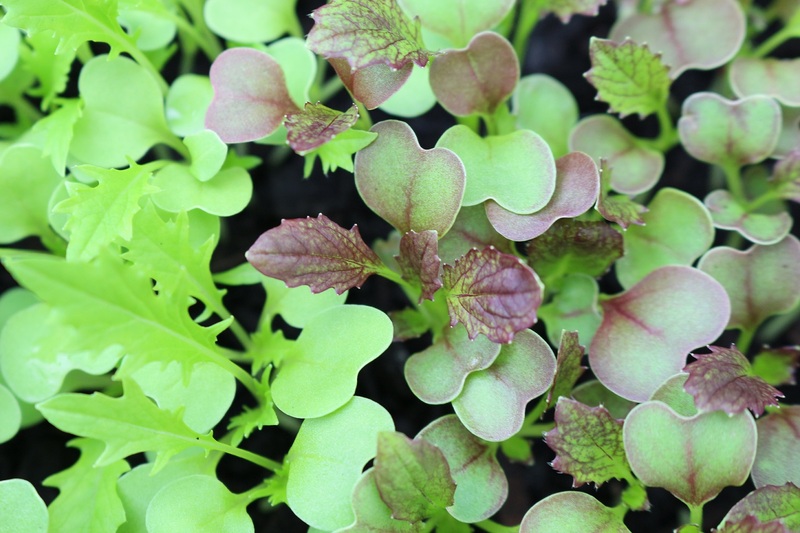 Dan Cox of L’Enclume in Cumbria recommends placing your veg crops into a bucket of cold water as you harvest, it helps to preserve their freshness, especially on a hot day, and makes cleaning easier once you get them to the kitchen. 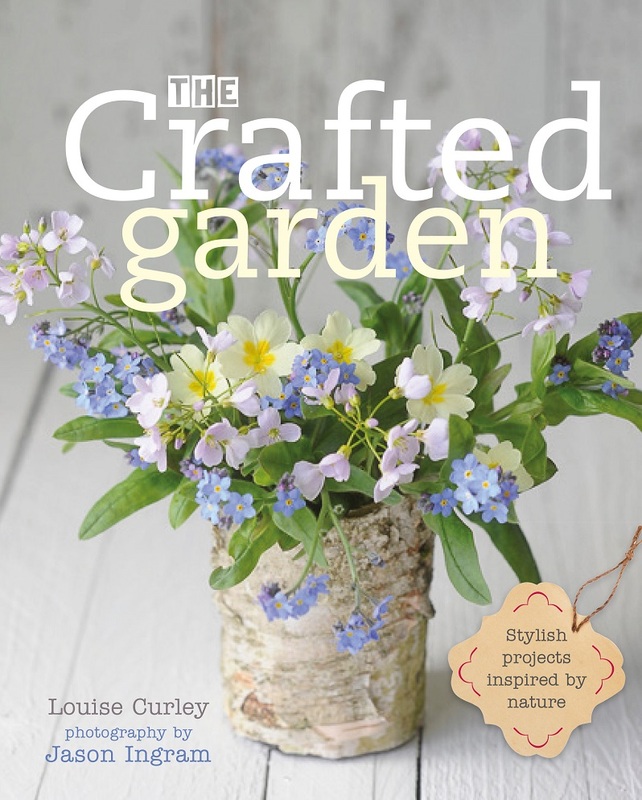 I will certainly be consulting the book when I make future seed orders, seeking out the recommended varieties, and growing home-grown sea kale sounds an intriguing prospect. 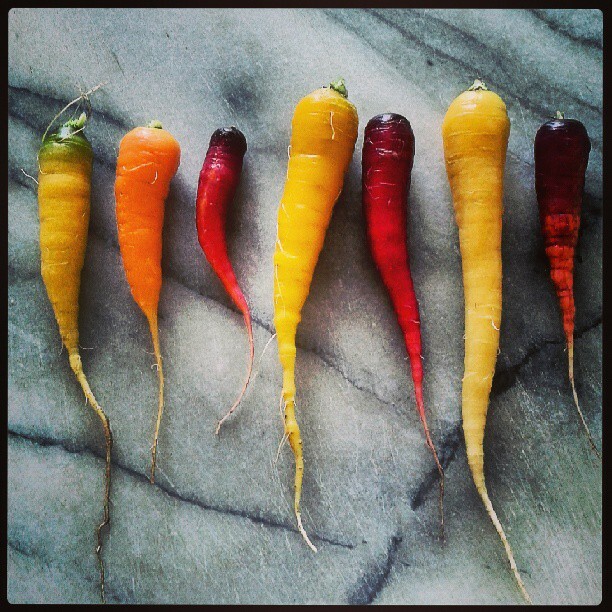 But for now it has inspired a few last-minute pots of colourful carrots – purples and yellows, some yellow heritage tomatoes, which I might just squeeze into the greenhouse, and a sowing of stripey beetroot ‘Chioggia’. 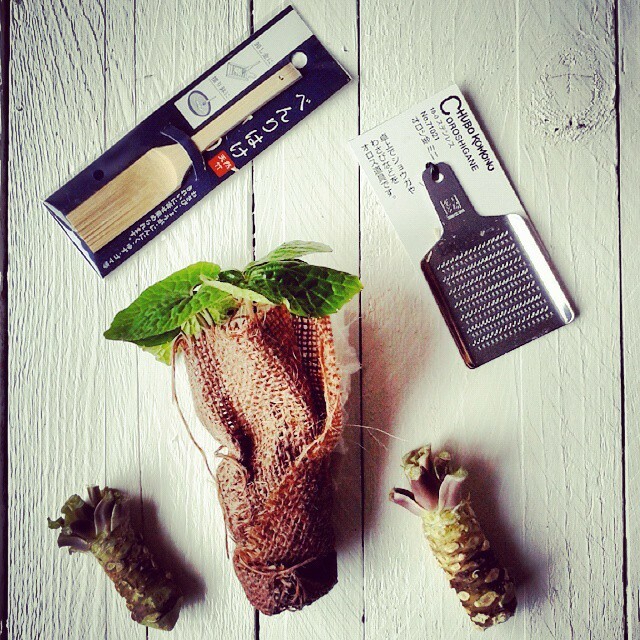 The recipes range from the simple but delicious sounding rocket pesto, squash soup and plum and almond flan to the dinner party type wet garlic barigoule and leeks vinaigrette. There are some recipes I probably wouldn’t attempt, but even these recipes provide inspiration in the form of flavour combinations and crops I’d like to try to grow in the future. 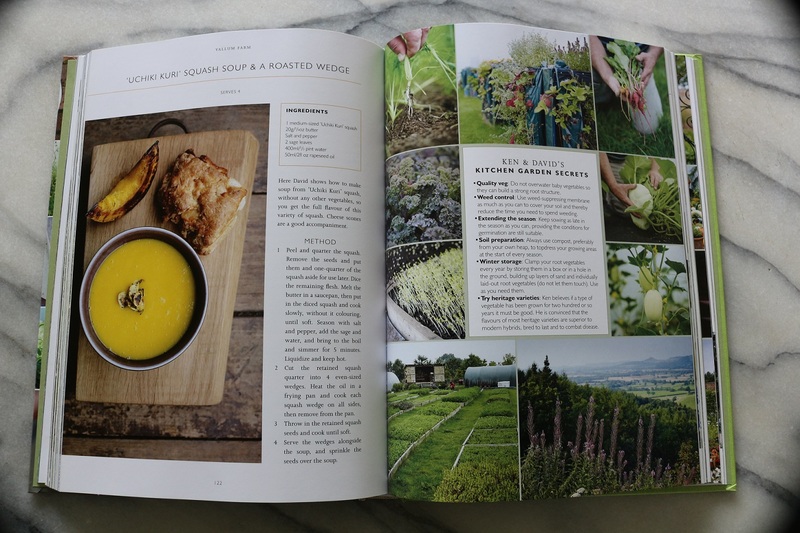 What I really loved about Kitchen Garden Experts is how it encapsulates how far British food has come in the last 10 to 15 years. Once derided by our European neighbours for our poor quality produce and indifferent restaurants we now have world-class eateries, chefs and artisan food. We’re learning to care about seasonality and appreciate the effort which goes into quality food production. 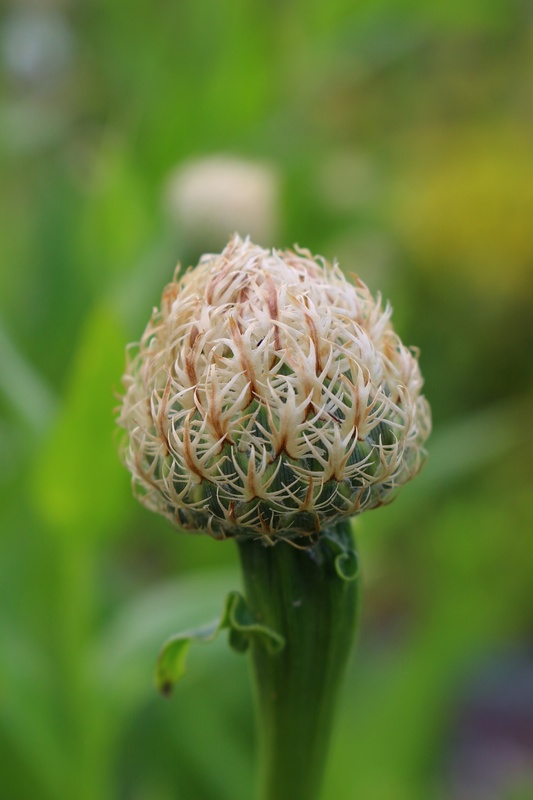 Jason’s photographs are incredibly beautiful, not just capturing the stunning food but also a sense of place for each of the kitchen gardens. If his photographs don’t have you drooling your way to the kitchen, reaching for the seed catalogue or picking up the phone to book a table at one of the restaurants I don’t know what will.